Picking up where the last volume left off, Maka, Soul, Black Star, and Tsubaki confront the twisted Dr. Franken Stein as per Lord Death’s orders as part of their remedial lesson. Unfortunately for them, Stein is considered the strongest meister to have ever graduated from the DWMA and is more than ready to prove why. The volume continues to pour on the action, albeit in a comedic manner, as Soul and Black Star challenge Death the Kid. Being a shinigami, Kid is more than able to hold his own aginst the two, using the fight as a means to show off just how strong he really is. The fight takes a humorous twist, resulting in a surprising finish. Afterwards, Maka and Soul find themselves in Florence, where the pair are confronted by a Witch named Medusa and her servant Crona. Despite Crona’s apprehensive personality, his sword Ragnarok, is more than strong enough to dominate the pair. Soul suffers a serious wound, forcing Maka to question her own abilities as a meister. When it comes to action, Soul Eater has not shortage. Every chapter features some character or other facing another with the reasons being little more than to prove who is strongest. While entertaining at first, if the series continues to sacrifice character development in exchange for single chapter fights, the series risks falling into similar trappings of other shonen series. In terms of artwork, Soul Eater is nothing to write home about; however, the character designs are all thoughtful and creative, allowing the reader to distinguish one easily from another. Soul Eater is a series that won’t cause its readers any headaches. The plot zips along at a brisk pace, thanks to all the fights. There are brief moments of character development but not enough to add anything significant to the cast. 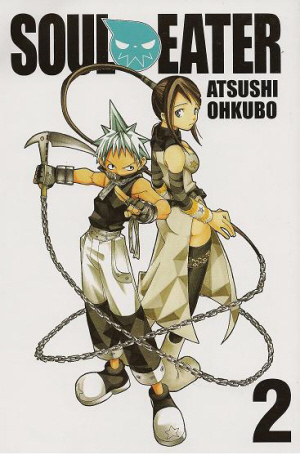 Unless things change, Soul Eater is a series you read for action, which will most likely suit it’s audience just fine.